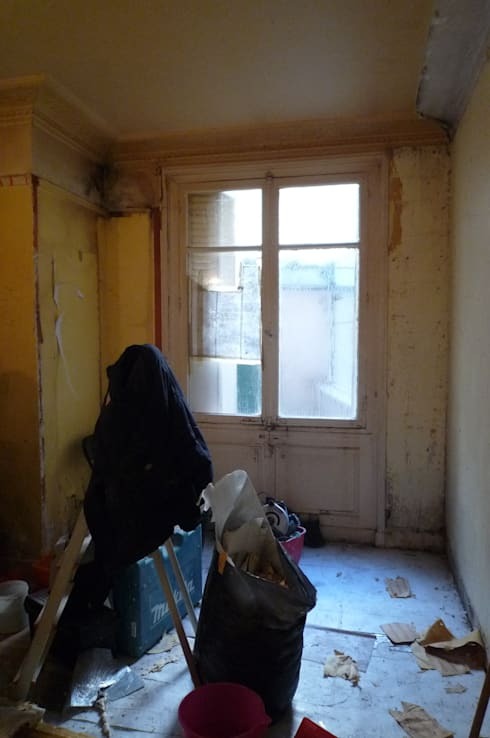 Thanks to the magic touch of Geraldine Laferte, a Paris-based architect group, a grubby home with crumbling walls and depreciating rooms has been successfully converted into a classy home. Even as the architects stepped across the crumbling threshold and took stock of the mess and chaos that surrounded them, they remained undeterred. Seeing that the house had untapped potential, they set about the task of recreating a home that would have a contemporary Parisian feel alongside its original classic theme. The perfect balance of style and practicality has been maintained while renovating this broken-down house. Find out how in this charming before & after tour! The home was in a seriously disappointing state with the walls stripped and rubble lying around. Nonetheless, there was plenty of scope for improvement. 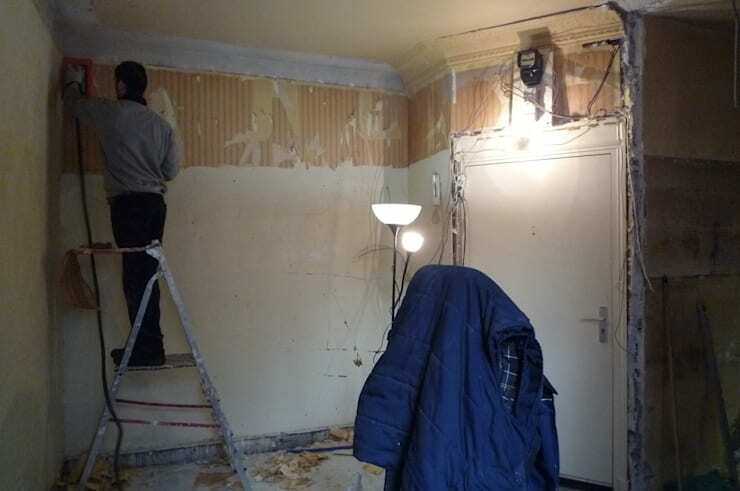 The space has been done up with sleek walls, wooden flooring, proper wiring and insulation to create a neat canvas. On this canvas, the designers decided to paint with neutral shades to gently offset the hues of in-built wood. The rest of the area has been left white. A pull-out desk has been installed on one side, with a chic Parisian sofa housing storage units on the other. Things have taken a definite turn towards retro here, with floor-to-ceiling cabinetry in white and some other sleek touches.The glossy black coffee table and the white cubes for seating can be pulled out from underneath the couch to make space for socialising! Tasteful patterned cushions with accent pillows in a rich brown adorn the couch. A snooze-fest is very much in order after all that work and play! 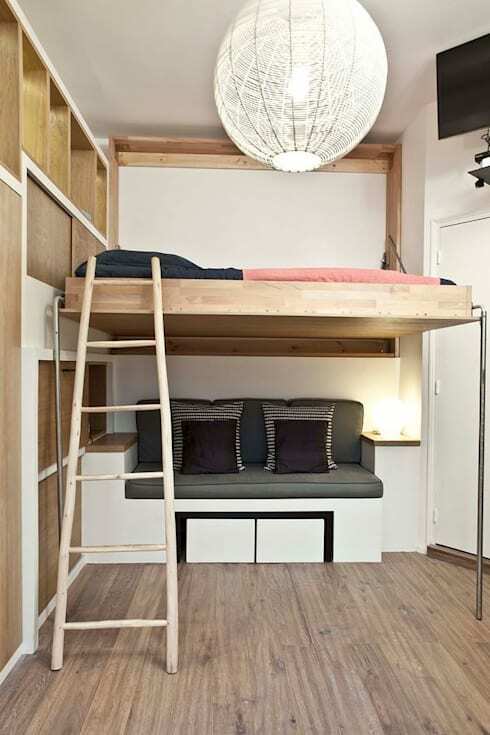 That’s precisely why the designers have installed a handy pull-out bed in the wall of wood. This sits right above the couch and makes a kind of mezzanine with a tapering ladder going up. The peach-hued bedding and large circular lamp make for a fun yet soothing atmosphere here. Open shelves on the head side double up as nightstands. Thanks to all the rubble and ruins, this space was not worthy of being called a dining room. 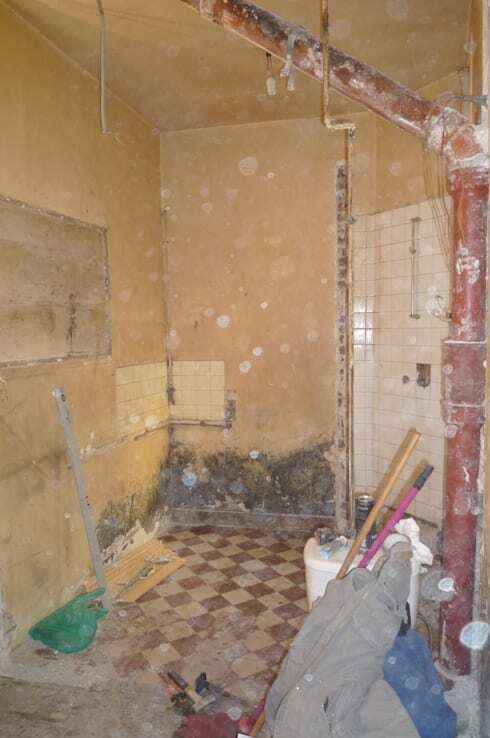 Forget cooking even the most basic of meals; old tiles and peeling paint across the room made this space difficult to even breathe in. 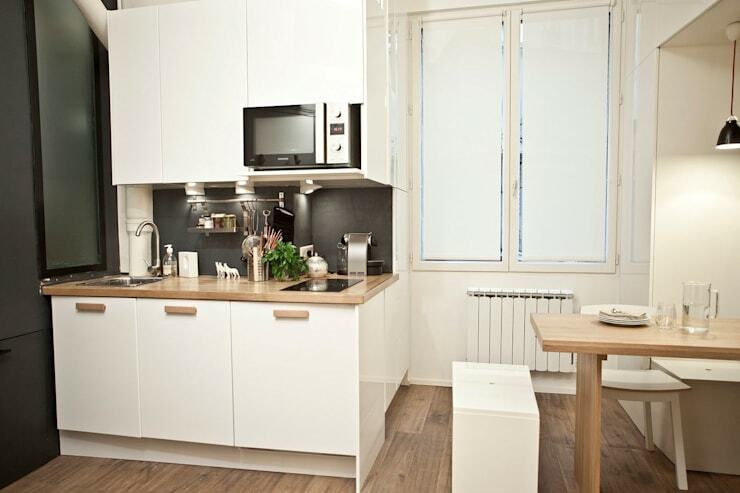 With a soothing white and wood palette, the compact new kitchen has plenty of room to whip up quick meals. The backsplash brings in a touch of robust slate, while the ultra-modern cabinets boast space for a microwave oven and cutlery underneath. 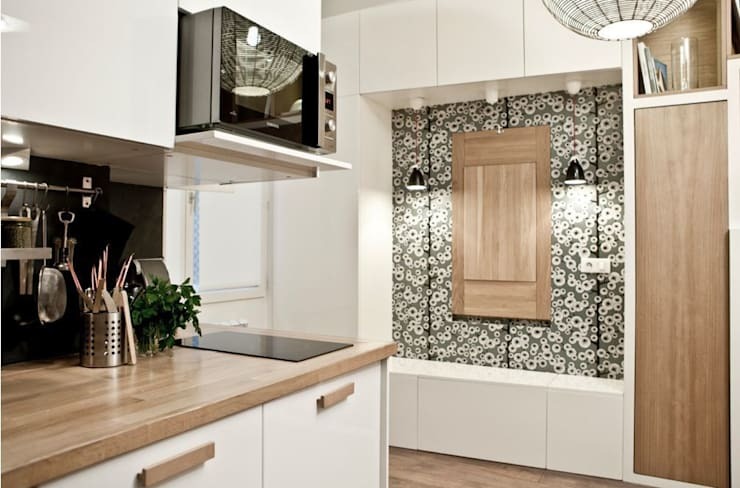 Just next to the kitchen, set in a patterned wall, the pull-out dining table adds yet another interesting and practical feature to this compact dining space. 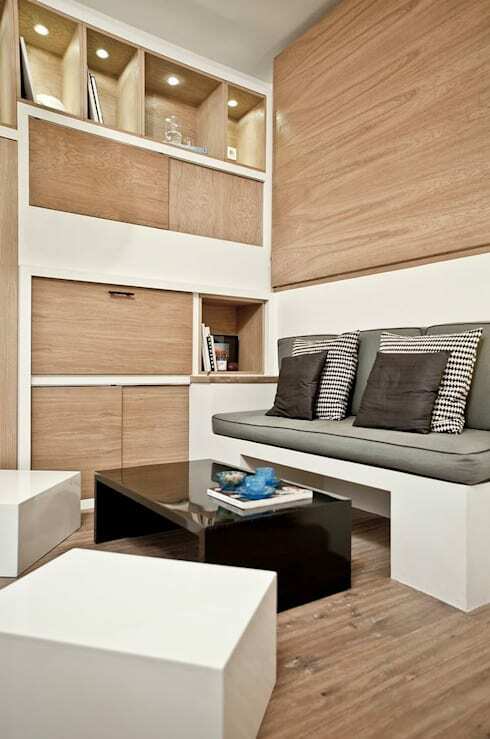 The white alcove doubles as a concept wall and bench with brilliant storage. Inspired by this awesome yet simple makeover? Here's another story you might like: A dreadful home gets a dazzling low-cost makeover. Are you impressed by the makeover of this tiny home?